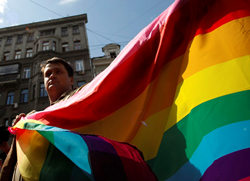 Key leaders in human rights address the issue of discrimination against the LGBT community. Consulate General of the Netherlands,120 Kearny Street, Suite 3100, San Francisco * May 14, 2014 from 6:30-8:00pm. Anne Frank was one of millions of victims of religious and cultural prejudice. Today, discrimination in all its forms continues to impede Anne’s vision for a better, more peaceful world. In this special program, part of The Anne Frank Center’s Confronting Intolerance Today speaker series, a panel of activists will discuss discrimination on the basis of sexual orientation, showcasing innovative approaches to combating intolerance here in the United States and in the Netherlands, where Anne Frank spent years in hiding. This program brings together Boris Dittrich, Human Rights Watch’s Advocacy Director for Lesbian, Gay, Bisexual, and Transgender Rights, with Susan Belinda Christian, Chair, San Francisco Human Rights Commission, and the Transgender Law Center’s Senior Strategist, Cecilia Chung, for a panel discussion addressing the issue of discrimination on the basis of sexual orientation. The program will be introduced by Hugo von Meijenfeldt, Consul General of the Netherlands. As part of The Anne Frank Center’s Confronting Intolerance Today speaker series, this event will provide a global perspective on this crucial topic; contrasting LGBT rights in the Netherlands, the first country in the world to open civil marriage to gay and lesbian couples, with the recent government crackdown on homosexuality in Russia. Examples from Africa and Europe will be discussed in conjunction with a diversity of attitudes from within San Francisco, a city synonymous with gay rights and marriage equality. This event is made possible through funding from the Ministry of Foreign Affairs of the Kingdom of the Netherlands, the Netherland-America Foundation, and KLM Royal Dutch airlines, the official airline of The Anne Frank Center USA. The event is kindly sponsored by the Consulate General of the Netherlands, San Francisco. The Anne Frank Center USA launched its Confronting Intolerance Today speaker series in 2013, in conjunction with the Sapling Project. Confronting Intolerance Today events showcase innovative approaches to combating intolerance here in the United States and in the Netherlands. Learn more about the speaker series at http://www.annefranktreeusa.com/af/sapling.nsf/Speakers.xsp. The event is free and open to the public. A Q&A and reception will follow the program, but space is limited. Please RSVP here: sfn-pcz(at)minbuza(dot)nl.